Judy Best | All about vacations ... I love vacations, yours and mine! 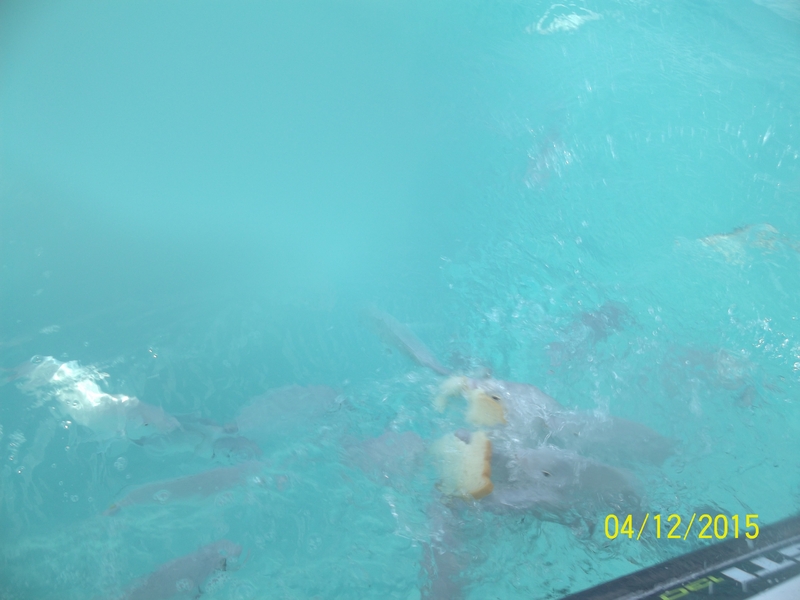 All about vacations … I love vacations, yours and mine! 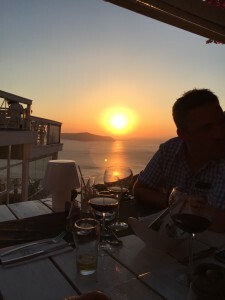 I had read that the sunsets over Santorini’s caldera are the most beautiful in the world, so my goal during our recent visit to Santornini was to enjoy great dinners in search of beautiful sunsets. I achieved my goal … enjoy! We had the best table in the house, thanks to the concierge at El Greco Resort, a table for eight at the rail overlooking the water with a direct view of the sunset. Tonight’s table was against the wall, and the sunset was challenged by a hazy, cloudy atmosphere, but we still enjoyed a fabulous meal with a stunning sunset. Wow! When we checked in at El Greco Resort, our first stop was the concierge desk to request reservations to view the sunset all three night. 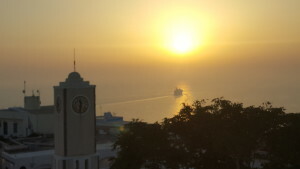 She said her top recommendation was Argo, but it was difficult to get same day reservations for the sunset. 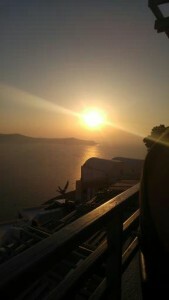 Hindsight 20/20, I’m so glad this was our last night, the best sunset, the best meal. Stay tuned, because I want to tell you about these fabulous meals as well. Have you been to Greece or just dreaming of a trip to Greece? 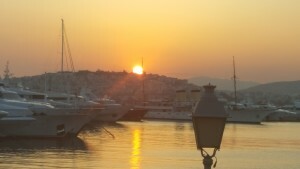 This is just one highlight from our Globus Greek Island Hopper Tour. Please leave a comment! Since we’re booked with friends on the Globus Greek Island Hopper Tour in 2016 (you should come with us), it just made sense to apply for Global Entry, which offers expedited customs clearance upon reentering the country, as well as TSA Pre-Check. 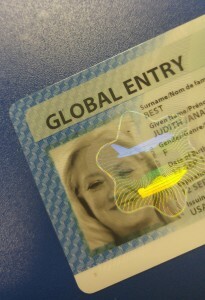 Friends of ours who traveled with us to Costa Rica already had their Global Entry cards then. We were off the plane in line for customs well ahead of them, but they cleared customs, were seated at an airport bar saving seats for us, with their first drinks in hand by the time we caught up with them. About a month ago, we applied for Global Entry online at this website. We had to list past addresses, employment, and more, and then pay the $100 fee, which is non-refundable. After about one week, we were notified that our application had been conditionally approved and to schedule an interview at a Global Entry Enrollment Center. We knew Little Rock did not have one, so we would have to travel to a center, and the closest ones to us are in Memphis and Dallas. Fortunately, we were traveling to Washington, DC, for the American Express Learning Forum and Travel Conference and a visit with our daughter who lives there now, which included lots of sightseeing. So, we scheduled an appointment in the Ronald Reagan Building, 1300 Pennsylvania Ave NW, just a few blocks from the White House. We walked in early for our appointment, but they immediately called us in. After answering a few basic questions and an explanation of how Global Entry works, we walked out with our Known Traveler number, and my Global Entry card arrived at our home just a couple days later. I entered the Known Traveler number in our Southwest Airline flight home from Washington, DC, and sure enough, we had TSA Pre-Check on that return flight. So, if you just fly domestically, TSA Pre-Check may be enough for you. If you travel or hope to travel internationally, might as well apply for Global Entry now. 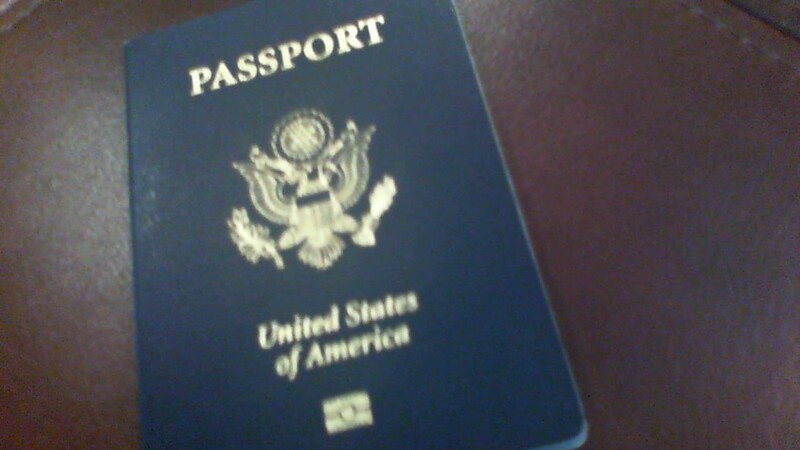 Does Your Passport Expire in 2016? The US Passp ort office is reminding us that they issued lots of passports in 2006, because that was the year the Western Hemisphere Travel Initiative went into affect. That means a large number of US citizens will need to renew their passports in 2016. If that’s you, you can expect delays in your renewal. I highly recommend starting your renewal early in the year, allowing plenty of time to get it back before your next trip. The US is also phasing out adding pages to existing passports. That just puts the US in line with what the rest of the world is already doing. Be sure you ask for the 52-page book, which is the largest they offer, because that gives you more space for stamps over the 28-page book. Once your passport pages are full, you’ll now have to renew your passport. Happy travels, and remember to give me a call when you’re ready to travel. Just like many of you, we’ve been enjoying TSA Pre-Check on our domestic flights the past few years. No need to remove your laptop from your carry-on, and I can walk through the security line with your shoes and jackets on. TSA quietly ended the free passes this week, and now the only folks with TSA Pre-Check are those who have applied, paid the application fee, and completed the in-person interview. If you’re ready to apply, there’s two different programs to consider. If you only travel domestically, TSA Pre-Check is exactly what you need. If you travel or hope to travel internationally, you need to apply for Global Entry, which also includes TSA Pre-Check. Here’s the link to apply for TSA-Pre-Check, and here’s the link to apply for Global Entry. Complete your application and pay your fee. After you’ve passed that check, you’ll be invited to set an appointment for your in-person interview. Many of you may have to travel to another city for your interview, like we did. You can plan your interview for a day and time you’ll be visiting that city anyway, if you like. Both these clearances last for five years, so I’d suggest you get your clearance today if you love to travel as much as I do. And, remember, I should be your first call for all your vacation travels if you value your time. 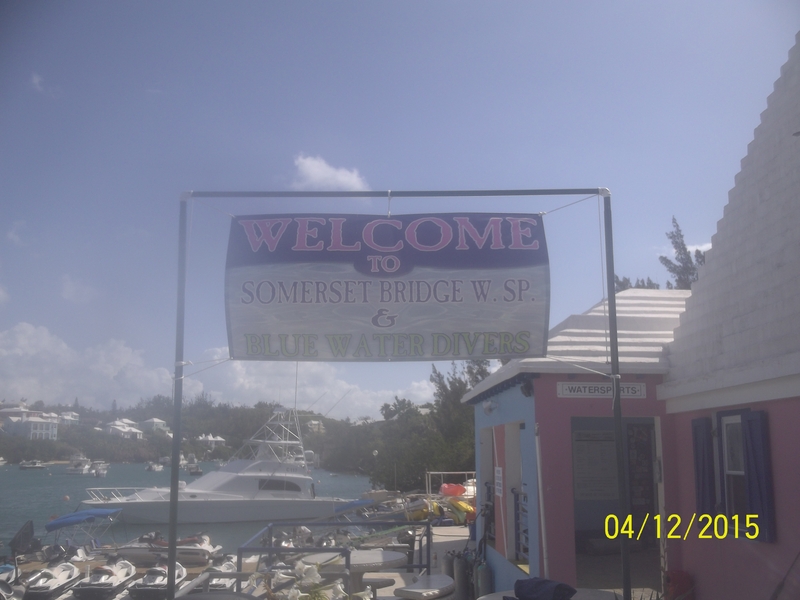 A Bermudaful Day with Somerset Bridge Water Sports! We’re just back from our second visit to Bermuda, and everyone needs to visit Bermuda at least once, and that probably won’t be enough for you. You can enjoy Bermuda’s beaches on your own with no problems, and public transportation, which includes ferry and bus, allows you to explore the entire island affordably. 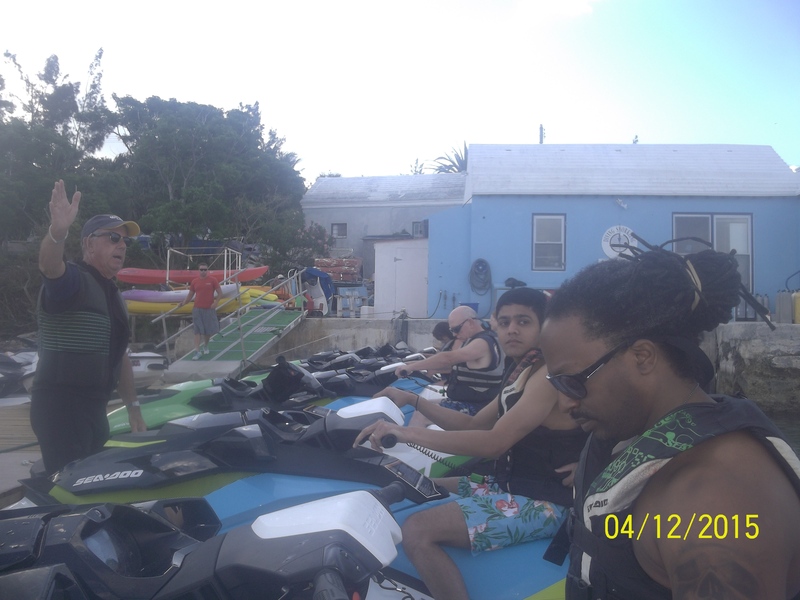 This time, we decided it was time to enjoy some watersports, so we joined our friends for a Jet Ski Adventure with Somerset Bridge Watersports. And, we saved a little money with their Early Bird Special at 8:15 am. What a great way to begin a day in Bermuda! My husband, Roger, is an old pro with jet skis, and he loves speed, so I was thrilled to ride as his passenger. This was a beautiful morning, and the cool breeze and the spray of the water kept us both smiling. Our tour guide, Harry challenged us to catch him, and Roger gave it his best. I was hanging on, having a ball, laughing because it felt like my body was going to take flight a lot of the time. Wow, what a great ride. Bermuda’s coastline was beautiful from the water, and I’m only sorry our tour was over before we made it to David Bowie’s Bermuda home. Taxis were waiting in the port area to take us anywhere, so our group of seven jumped in a van for the short ride to Somerset Bridge. The taxi driver headed inside with us, because Somerset Bridge Watersports pays for your taxi ride to their facility. And, we all settled in to complete our paperwork for the ride. We sure would have loved some coffee while we did this, so that’s a little suggestion for their early bird business. After our paperwork was completed, we headed inside for our safety briefing, and to store our belongings in their facility. The ride is fast, so anything that’s not secured tightly to you needs to be left behind, including sunglasses and hat. My hat was the only loss on our trip, so I replaced it with a Bermuda hat shortly after this excursion. And, we all donned our life jackets, before boarding the jetskis. Bermuda had some damage from Hurricane Gonzalo last year, so Somerset Bridge Watersports has all new jet skis as a result. We all boarded our jet skis, ready to head out in our water tour of Bermuda. Our tour guide, Harry, told us, Speed is our friend, and the jet skis were so much easier to handle at speeds above 40. The gals in our group had no problem handling the jet skis, and we only had one couple in our group who didn’t fare well, because the wife kept telling the hubby to slow down, when he really needed to go faster to get better control. Once our ride was over, we waited outside Somerset for a while, laughing and sharing our jetski stories, until we realized that no taxis were coming down there, so we all strolled out to the main road, where a taxi quickly pulled over to take us back to the port. I absolutely recommend Somerset Bridge Watersports for all your water fun in Bermuda, whether you want to kayak, jet ski, ski and/or snorkel, or rent a boat. Tell them I sent you!